We’re not really a meal eating culture anymore. Certainly that’s something that future culinary historians will acknowledge as they float in tubes of phosphorescent liquid writing books with their IBrains. 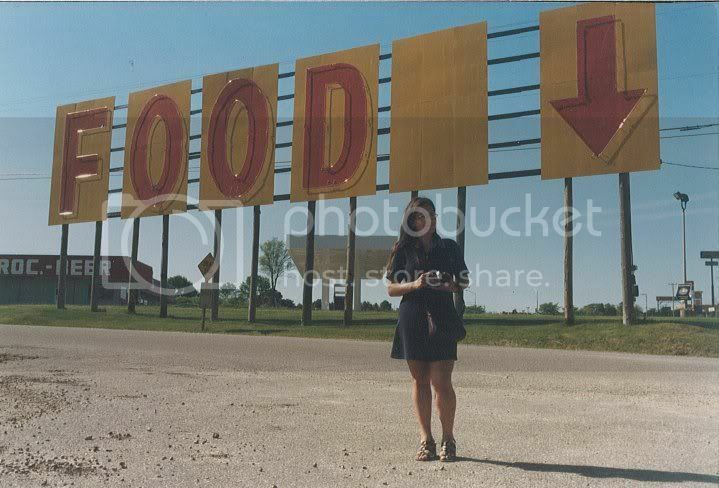 Instead, we “graze,” grabbing a snack here, eating it in the car or on the train. While a meal is a defined and ordered system (if you’re Asian, for example, it must include rice, if you’re a Westerner, probably meat. If you’re me, than bread, yummy, delicious bread) a snack breaks rules. Savory or sweet, raw or cooked, a complement to a meal or a subset of it. All of these count. And yet, we like to pretend to be healthful at the same time that we’re snacking on energy bars that are no different than the candy bars sold one aisle over. 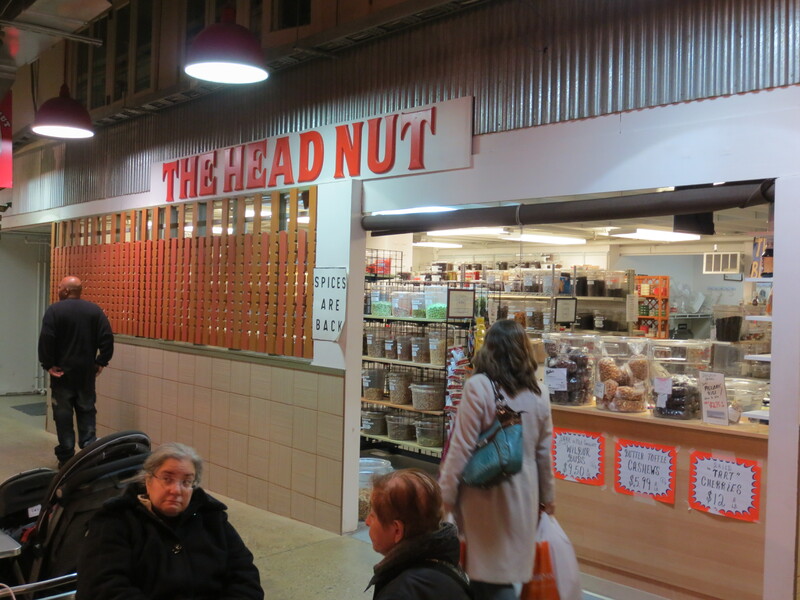 The rising stock in such snacking must partially explain the appearance of The Head Nut at the Reading Terminal Market. 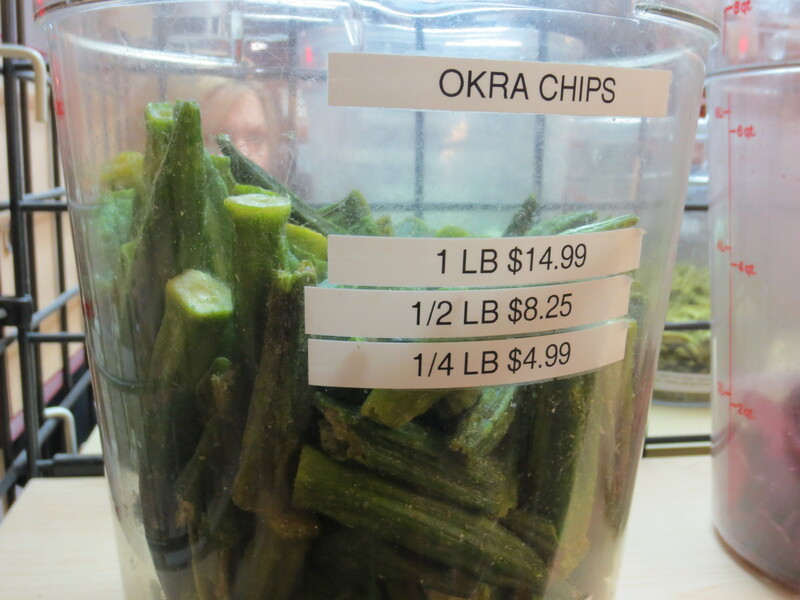 though they should be renamed okra spears since that’s what they look like. What do they taste like? Crisply hollow, like a cheap Easter rabbit, but with a slight vegetal flavor. They need to be saltier, if you ask me, but my companion loved them. 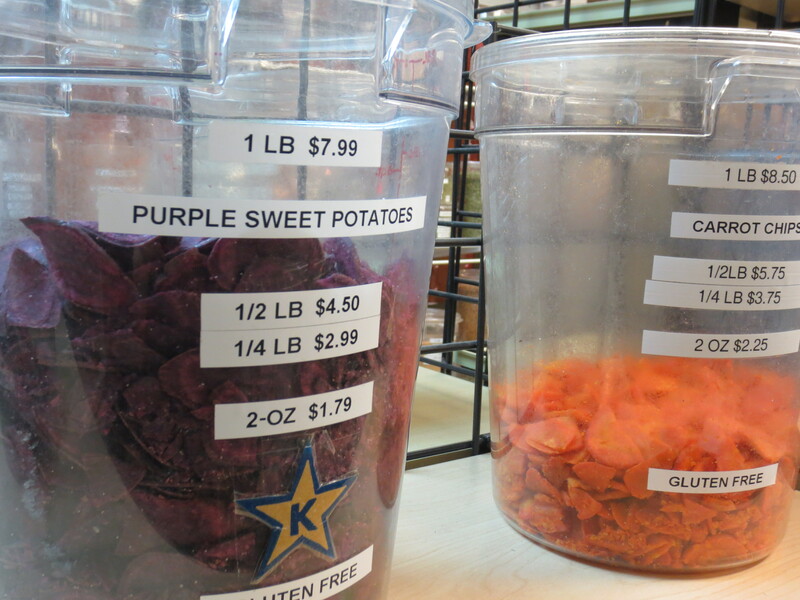 Other vegetarian snacking included such colorful items as purple sweet potato and carrot chips, clearly inspired by companies like Terra chips and others. For those with a sweet tooth, the cocoa dusted almonds are addictive. Seriously, we nearly devoured a bag on the car ride back to South Philly, and the few that remained disappeared before I could take a photo. I’ve got visions of a dried vegetable crudite platter at my next party (don’t worry, you’re invited!) and then heaps of cocoa almonds for myself. Course, the real question is can a store devoted only to such items survive? The prices aren’t cheap and the customer service leaves much to be desired. But, perhaps as long as Americans keep grazing, we’ll need places exactly like The Head Nut. Recommended: cocoa dusted almonds. Also, a jar of ginger spread by The Ginger People, which is intensely spicy and wonderful.